Police say it appears the man and woman got into a fight and he chased the victim from their home, dousing her in petrol. POLICE ARE SEARCHING for a 51-year-old man they say burned a woman to death yesterday after he poured petrol on her and set her ablaze. Police said in a statement that the woman, whose name was not released, ran about 1.40pm from a home on Cordova Street engulfed in flames. The woman collapsed on the scene as neighbours tried to help her. 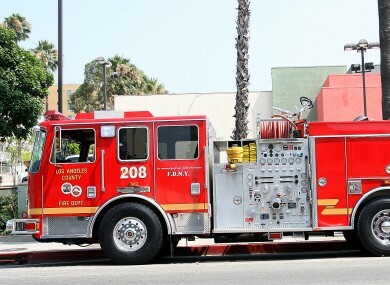 Police said that shortly afterward, the Los Angeles County Fire Department arrived at the scene and took her to a nearby hospital, where she died. It appears the woman and the suspect got into a heated argument that led to a fight. Investigators said the man chased from the victim from their home and doused her with petrol. The man is then said to have started the fire, possibly with a lit cigarette. Investigators said he ran off after the attack. Email “Police hunt man suspected of burning woman to death on Christmas Day”. Feedback on “Police hunt man suspected of burning woman to death on Christmas Day”.